A Domain name is your online identity. It is a “plain English” alias that points to the server where your web site resides (actual server addresses are a series of hard-to-remember numbers). Your Domain name belongs to you as long as you keep its registration current. It stays with you if you move your site from one server (host) to another. Generally, “.com” denotes a commercial business, “.org” denotes a non-profit organization, “.net” denotes a network or hosting service, etc. There are more than 56,000,000 domain names currently registered. The one you really want may already be taken! Be prepared to consider alternatives. 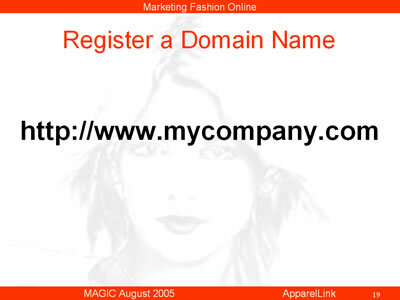 You register your Domain name with a registrar. We recommend Network Solutions: http://www.networksolutions.com. They are not the cheapest but they are the original and best established of registrars.